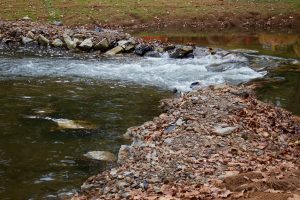 Monocacy Park Stream Restoration – Conservation is on the Ground! 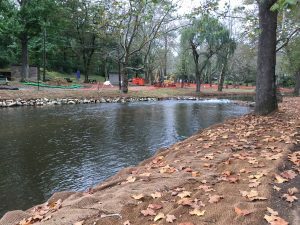 Together with the City of Bethlehem and many supporting partners, Wildlands Conservancy commenced construction during summer 2017 to bring the City’s new vision for Monocacy Park to life. THE VISION: Enhance the community’s connection with nature in this sought-after outdoor space, while also protecting and restoring the park’s natural features, most especially the Monocacy Creek. Visitors will visibly notice the best management practices Wildlands put to work to make Monocacy Creek cleaner and safer, offer improved fishing and to restore natural habitat for native plant, pollinator and wildlife species. The creation of dedicated stream access points for safe, easy access and fishing enjoyment. The removal of unnatural, unsafe, decaying railroad ties that lined the stream. The stabilization of stream banks with attractive and beneficial native vegetation. The replacement of habitat-impairing rock dams with beneficial instream structures for fish and other cold-water species. Unnatural, decaying railroad ties that lined the stream and contributed to erosion were removed. Structures like this, designed by the Pennsylvania Fish & Boat Commission, were installed after the rock dams were removed. They create the necessary riffles and pools for native fish populations to spawn, grow and thrive. Kristie Fach, director of ecological restoration, talks with Lehigh Valley Live about the restoring the Monocacy Creek as it flows through Monocacy Park. Streamside Plantings Taking Root Throughout the Region!